They set out to conquer the world one pasture at a time. Divide your sheep and try to block the sheep of your opponent. A mixture of family fun and strategy at its best. Played this at the recent Great Derby Board Games Bash at the Silk Mill, and I was very impressed, We had also played Hey! That's My Fish (HTMF) and this one is similar, as it is a strategy game where you are vying for area control and trying to cut each other off without getting cut off yourself! I prefer this one though as it's a doddle to set up and the player counters are fabulous - heavy and great quality like poker chips and each has individual artwork of a different sheep on it! setup is variable as well, meaning you can vary the board shape and design which is cool. Here players have a single stack of 16 or 18 sheep chips which they can move in a straight line along the hexes, very similar to HTMF. The difference here is that instead of having 4 individual penguins to move around, you have this stack which you can cut and move however you choose, you just have to leave at least one chip on the hex where you were. The winner is the player who has the most hexes covered, so it's bad news if you end up getting a stack of chips 'hemmed in' by other players! Another difference from HTMF is that this game is more open, you can move wherever you want, unlike in HTMF where you are drawn to the tiles with the most fish on to start with. 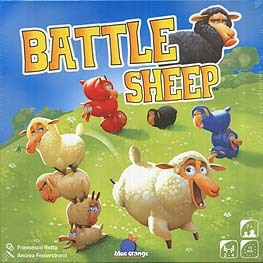 In battle sheep you have to think more about the other players kind of like a big game of chicken! Great components and artwork and an excellent strategy game, and another that my 6 year old can play, which is awesome.